You Don’t Know What You Don’t Know: Everything You Need To Know To Buy Or Sell A Business is an in-depth examination of the process of purchasing, growing, and eventually selling a business. Author Terry Lammers tells how he got into the mergers and acquisitions business, and his relaxed style feels like having a cup of coffee with a friend. He breaks down the complicated business and financial topics into small pieces that are easy to digest and, more importantly, simple to apply. Current business owners and soon-to-be business owners will walk away with a wealth of knowledge and sound advice that leads them on the path to succeed at every stage of the business cycle. The pros and cons of buying an existing company. The step-by-step process of buying a company. The critical factors that determine a company’s worth. The importance of solid financial statements for both the company owners and the prospective buyers. How to find the right attorney to handle the deal. How to choose the right bank for your specific needs. How to know when you need a financial advisor and how to choose the right one. How to get maximum value for your company. How to prepare your company to sell. How to develop a life plan for after the sale. Terry Lammers was the President and Owner of Tri-County Petroleum, Inc. (TCPI). TCPI was a wholesale fuel and lubricants supplier that serviced Southern, IL and the St. Louis metropolitan area. Between 1992 and 2010, Terry grew the business from $750,000 in sales to over $42,000,000, during which time he acquired eleven different companies. The entire business was sold in 2010 to Growmark, Inc. and eight of its FS Member Companies. After basking in that successful sale, Terry’s wife finally told him he had to get another job, and he spent three and a half years as a Vice President of Commercial Banking with Regions Bank. In July of 2014, Terry teamed up with Dave Kunkel and launched Innovative Business Advisors, a comprehensive business brokerage firm that helps people buy and sell companies, performs business valuations, and provides exit planning. Terry is a Certified Valuation Analyst (CVA) from the National Association of Certified Valuation Analysts (NACVA). 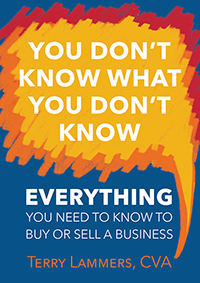 You Don’t Know What You Don’t Know: Everything You Need To Know To Buy Or Sell A Business is available for purchase or download (ebook is free) on Amazon. Be sure to follow us on Facebook, Twitter and LinkedIn for the latest information about business tips and resources, current listings, and business valuation services.